Cultural critic Mark Dery coined the term “Afrofuturism” in his essay “Black to the Future,” and its meaning has expanded to encompass alternative visions of the future influenced by astral jazz, African-American sci-fi, psychedelic hip-hop, rock, rhythm and blues, and more. This reading takes a multi-genre look at Afrofuturism and its literary interpretations. Speculative fiction writer N.K. Jemisin’s work has been nominated for the Hugo, the Nebula, and the World Fantasy Award. She was the first black writer to win the Hugo Award for Best Novel, in 2016 for The Fifth Season and in 2017 for The Obelisk Gate. 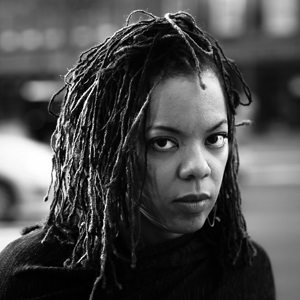 Airea D. Matthews is the author of the poetry collection Simulacra, winner of the 2016 Yale Series of Younger Poets. Matthews creates in her poetry a world not bound by time, weaving figures from the past into the present and interrogating the present for the sake of the future. She is the executive editor of The Offing.